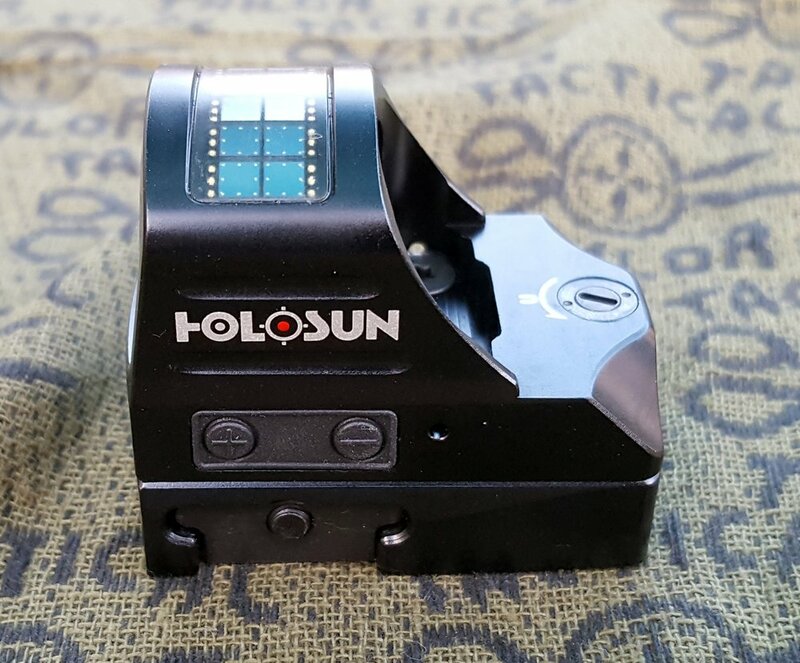 If you have listened to the podcast, you already know that we are fans of the Holosun products. 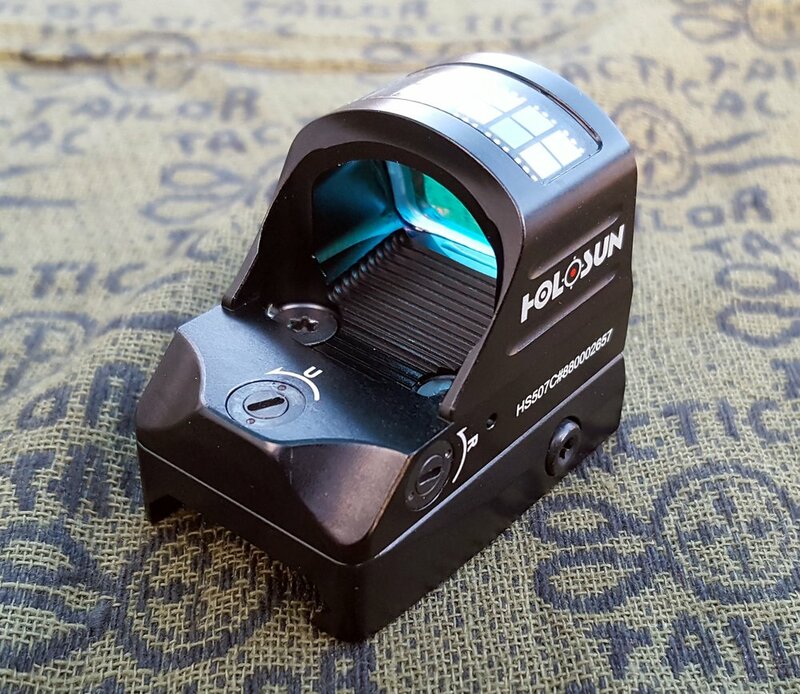 Holosun came out with their micro reflex sight, the HS507c, some time ago. This little reflex sight has some really awesome features. After waiting a while for the green one to come out, I asked if they would send a red one out for review. Yes, I got tired of waiting for the green, which is either available now, or soon will be. The HS507c is small. Coming in at 2.65 ounces, it is light also. Dimensions are - 1.8” long, 1.2” wide, and 1.6” tall. The visible window is 0.63”x0.91”. I like the window size, it works well for me. One of my favorite aspects of the 507’s are their “industry standard” mounting platform. Holosun did some homework and decided to use the Trijicon RMR mounting holes and form factor. This means the 507 should work with all RMR cut pistol slides and mounting bases. I used it on two different RMR cut glock slides. The 507 fit both of them just great. As opposed to many other micro red dot sights, the 507 has different reticle options. Not only can you choose the 2moa dot, but also a circle dot, or just the ring! The ring is a 32moa circle, and the circle dot adds in the 2moa dot in the center of that ring. I tried out all 3 types of reticles. I liked the ring only reticle for close up shooting, around 5 yards and closer. Of course the circle dot worked well for me from about 5-10 yards. Which leaves the 2moa dot. The dot is what I actually leave the sight set to. Brightness adjustments are on the left side with a “+ or -” button. There are 10 daylight and 2 night vision settings. I found that the dot reticle works best for me, of course your choices might be different. Either way, the Holosun gives you choices that other sight manufacturers don’t. 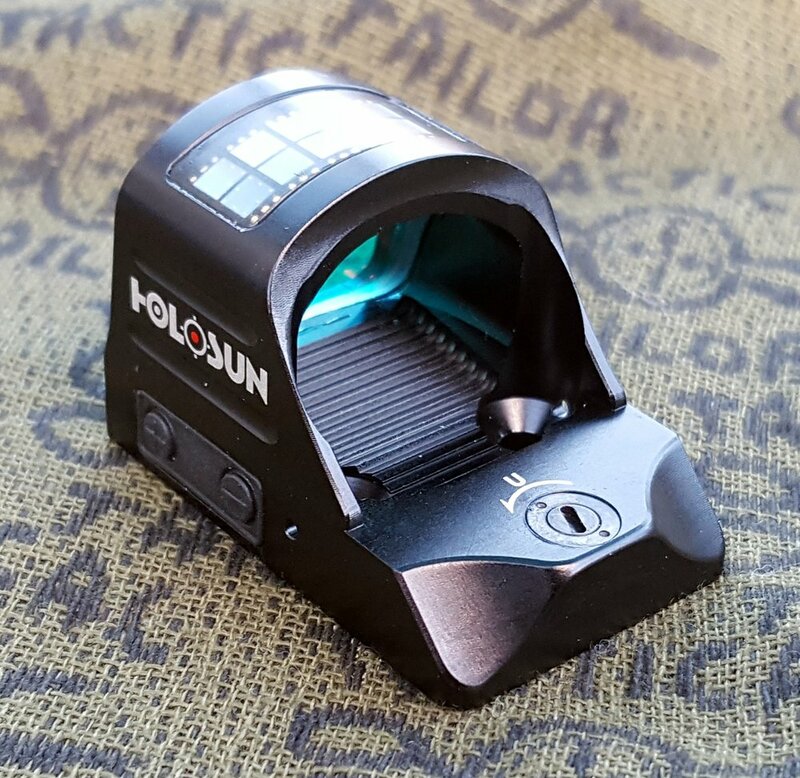 The Holosun HS507c is also packed with a “Solar Failsafe”. Yes that means that the 507 can be run off of solar power. On top of the window housing is a solar panel. The panel allows the 507 to run without the need of a battery in all but the very darkest of conditions. This feature also automatically adjusts the diodes brightness. I am not big into auto adjusting sights, but the Holosun’s works well. FYI, I don’t like the auto adjust features because if the sight is in a dark place, and the targets are well lit, the dot will not be bright enough on the target. Having a “Failsafe” for when or if the battery dies is still a great option. Speaking of battery, it uses a CR2032 with up to 100,000 hours of life. Or around 50,000 hours of constant on in the middle brightness setting. It is a good thing that it has long battery life. To change the battery, one has to remove the sight, as the battery is changed through the bottom of the sight. Not my favorite, especially since some of Holosun’s regular sights have a battery tray on the side. If you are using the 507 in the battery mode, it has an auto off/shake awake feature. As one can guess, the sight will automatically turn off after a set time time period of no movement. Settings are something like 1,2,4 hours of non-use. There is also a “don’t turn off” feature. The instructions tell you what buttons to press for adjusting this. Along with the auto off comes the shake awake feature. Just as it states, any movement of the sight will wake it up to the last brightness setting. I left the 507 in my safe, facing to where I could see it. It is so sensitive, that just opening the safe would turn it on. So I left it undisturbed in a safe, dark place. When I returned, I could tell the sight was off, when I just touched the sight lightly, it turned on! So it works spectacularly. This feature aids in the extra long battery life. This little sight is a beast. The 7075 anodized aluminum housing can take quite a beating. They rate the thing at 5000G’s! I even ran the 507 loose, yes I didn’t loctite the screws at first. If you want to use the 507 on something else, it does come with a picatinny rail mount. I may not have as many rounds through the sight as I’d like. But so far, the 507 has done everything I wanted it to do, even more. The dot or circle is pretty clear. A lot better than many red dots, but not as sharp as a few. Some notable firearms people have used the 507 way more than me. Guess what, they have held up for them. I’d say the 507 is good to go, especially since I have used other products from Holosun. All in all, I am super happy with the HS507c. Holosun turns out a nice product. It has various reticle, auto off/on functioning, solar use, and uses a RMR mounting pattern. So if you are looking into something like this sight, check out Holosun. Holosun keeps impressing me with their products. Better Than The Rest... HANDS... DOWN! I have to say, this beats out the RMR on EVERY front. I gave the RMR a try and it failed miserably to impress me, especially for almost $600. The HS507C is rugged and has withstood my 1,000 round test on my 226 Legion. It’s dead accurate with the 2MOA dot and the CQB Circle it fantastic for that speedy target acquisition. Holds zero perfectly as I didn’t have to adjust it at all since I sighted it in with the first mag. The clarity of the glass and lack of severe parallax (unlike the RMR) is unparalleled in such a rugged micro red dot. The ability to change reticles puts it a head above the rest and the battery life is second to none! 10 + YEARS! I’ve used them all, The Delta Point, Burris FastFire, Doctor, RMR, Vortex Venom, etc. The auto adjust brightness works well and on a sunny Texas day that dot it bright and very crisp. The RMR is splotchy and oblong. For only $300 you are getting a VERY Feature-Rich product that has a lifetime warranty to back it and it worked so well I bought a second one. Definitely worth the money and don’t get me wrong, I waited 3 months for the first one, it was agony and I wasn’t expecting to wait any longer than 2 weeks for the backorder. But honestly it was DEFINITELY worth the wait. 5 stars all day long. And I have worked with Holosun before and if you have a problem, they will fix it and have it back to you up and running within a week. Let’s face it, even Trijicon and Leupold manufacture a lemon every once in a while. It’s the luck of the draw when it comes to mass produced items.